Grey wood trunk with wheels. Grey wood trunk with wheels. 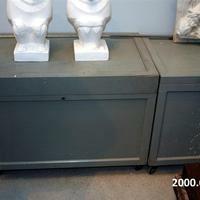 Painted grey trunk on wheels with handles on either side. Inside has 2 small boxes. Lid is dirtier than other boxes of the same type. 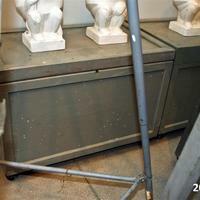 Grey wood trunk with wheels. 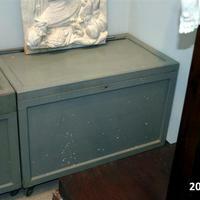 Wood trunk painted with 2 metal handles on either side. Has 4 wheels with 3 movable inside boxes.